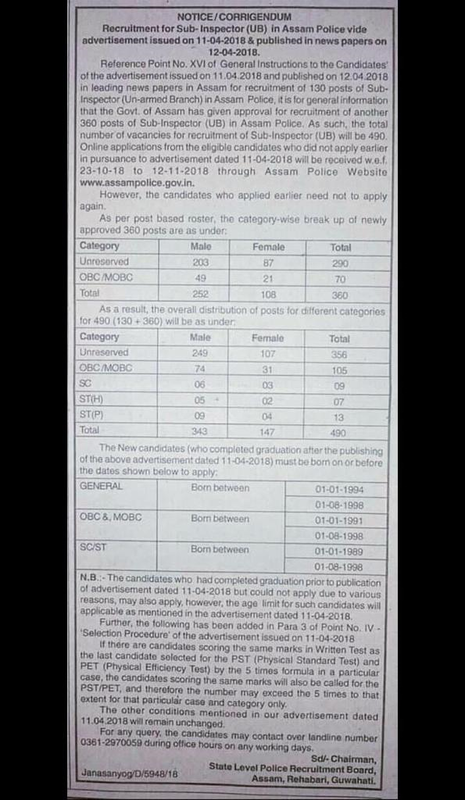 With reference to the advertisement issued on 11.04.2018 and published on 12.04.2018 in leading news papers in Assam for recruitment of 130 posts of Sub-Inspector (Un-armed Branch) in Assam Police, it is for general information that the Govt. of Assam has given approval forrecruitment of another 360 posts of Sub-Inspector (UB) In Assam Police. As Such, the total number of vacancies for recruitment of Sub-Inspector (UB) will be 490. Age: The New candidates (who completed graduation after the publishing of the above advertisement dated 11.04-2018) must be born on Or before the dates shown below to apply. N.B. : The candidates who had completed graduation prior to publication of advertisement dated 11.04-2018 but could not apply due to various reasons, may also apply, however, the ago limit for such candidates will applicable as mentioned In the advertisement dated 11-04-2018. Selection Process: Candidates whose applications are found correct in all respects will be called for a written test which will be conducted in all the District Headquarters. The candidates will have to appear for the Written Test in the district of his/ her present residential address. The Chairman reserves the right to change the venue of the test and no representation etc. will be entertained in this regard. Before entering the examination center, biometrics of each candidate will be done. Candidates will use black or dark blue ball pen to answer the OMR based answer sheet. Duration of the test will be of 3 (three) hours. Candidates numbering only 5 times the number of posts in respect of each category (Unreserved, S.T. (P), S.T. (H), OBC/MOBC) both male & female will be called for PST (Physical Standard Test) and PET (Physical Efficiency Test) on merit basis. A list will be published in the Assam Police Website as well as in leading dailies of Assam. Physical Standard Test: After the Call letter and the identity are found correct, the candidates will be asked to appear in the PST. The PST will carry no marks. Measurement of the height, weight and chest (only for Males) of the candidates will be taken after which the candidate will be inspected by a medical officer for preliminary checkup like knocked knee, vision test, colour blindness test, flat foot, varicose vein, physical deformities etc. Varicose vein shall be considered a temporary disqualification. Once a candidate clears the PST, he/she will have to appear in the Physical Efficiency Test (PET). Physical Efficiency Test: The Physical Efficiency Test will carry 40 marks. It will have 2 (two) events viz. a) 1600 meters race for male candidates and 800 meters race for female candidates. b) Long Jump - for male 335 cm (minimum) and for female 244cm (minimum), 3 chances (longest valid jump will be considered). a) Race: Those who qualify in the PST will have to appear in1600 meters race to be completed within 450 seconds. Maximum qualifying time 450 seconds. b) Long Jump: Minimum 335 cm for long jump (3 chances to be given and the longest valid jump rounded off to the nearest cm will be considered for awarding marks). a) Race : Those who qualify in the PST will have to appear in 800 meters race to be completed within 240 seconds. Maximum qualifying time -240 seconds. 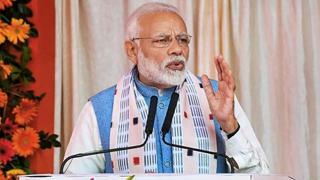 b) Long Jump : Minimum 244 cm for long jump (3 chances to be given and the longest valid jump rounded off to the nearest cm will be considered for awarding marks). Further, the following has been added in Para 3 of Point No. IV -'Selection Procedure' of the advertisement Issued on 11-04-2018. If there are candidates scoring tile same marks in Written Test as the last candidate selected for the PST (Physical Standard Test) and PET (Physical Efficiency Test) by the 5 times formula in a particular case, the candidates scoring the same marks will also be called for the PST/PET, and therefore the number may exceed the 5 times to that extent for that particular case and category only. How to apply: Applications must be submitted online through Assam Police websitewww.assampolice.gov.in. Online applications from the eligible candidates who did not apply earlier in pursuance to advertisement dated 11-04-2018 will be received w.e.f. 23-10-18 to 12-11-2018 through Assam Police Website assampolice.gov.in. However, the candidates who applied earlier need not to apply again. The other conditions mentioned in our advertisement dated 11.04.2018 will remain unchanged. For any query, the candidates may contact over landline number 0361-2976059 during office hours on any working days. Can Other State Students Can Apply?